Amazon listings revealed that Aksys Games will release Code: Realize Wintertide Miracles Limited Edition for PS Vita and PS4. 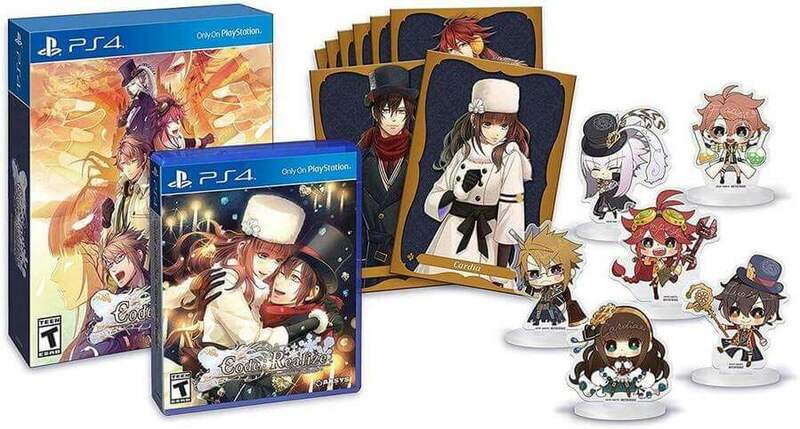 Code: Realize Wintertide Miracles Limited Edition will be released on February 14, 2019 for PS Vita and PS4, as per the Amazon listings. The Limited Edition is priced at $69.99 and includes: copy of the game, 6 - 3” acrylic Figurine Featuring the chibi artwork of the characters, eight - 4x6 over-sized character cards all in a collectible box. "Made by the Masters of the Tome genre, idea factory and design factory, code: Realize ~wintertide miracles~ continues the adventures of the poison-skinned maiden Cardia and a selection of famous (and famously handsome) figures from Western literature as they face new challenges, new friends and foes, and new opportunities for love. The (new) belle of the ball - cantarella, the mysterious young lady Cardia met during One of her many adventures, gets her turn in the spotlight."